First Line: He gasps for every breath, bobbing to the surface of the salty water like a cork then sinking again, towed under by an unseen force. What began as a routine murder investigation turns into something extremely complicated when Detective Inspector Wesley Peterson begins uncovering secrets and deceptions from the victim's past. Meanwhile archaeologist Neil Watson-- with the aid of a very attractive woman named Lucy-- finds himself working at two different locations. One is historic Paradise Court. The other is a ruined village named Sandrock, most of which fell into the sea during the First World War. As Neil works, he can't shake the feeling that he's going to find something that will help his friend Wesley with his murder investigation. Little does he know that his help will be invaluable because this is the most puzzling case Wesley has ever faced-- and his own family has become a target as more victims fall prey to a faceless killer. 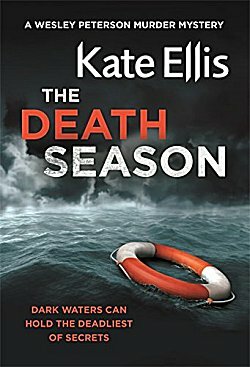 I have long been a fan of Kate Ellis's Wesley Peterson police procedural series which is set on the Devon coast. Ellis always has two timelines in each book, one historic and one present day, and they always tie together in some way. Moreover, this author is a triple threat. She can bring little-known chapters of history to life, she can create absorbing mysteries, and her characters are so well drawn that I feel as though they've been friends for years. Everything comes together perfectly in The Death Season. Trying to deduce whodunit was complicated by the fact that so many characters in both timelines weren't whom they appeared to be. The murderer in the present day is one of Ellis's best and will probably give readers chills down the spine. And then there are the characters' lives to be considered. Wesley's boss, Gerry Heffernan, is still recuperating from what happened in the previous book. He's been given cold cases to review and feels as though the higher-ups are trying to put him out to pasture. Wesley is still trying to be Super Cop, Super Husband, and Super Dad-- with mixed results. I've had a rocky relationship with Wesley's wife Pam since the first book in the series. She's one of these women who marry a police officer and then can't understand why he works such long hours. I keep trying to second-guess Ellis on how that marriage is going to turn out, but I haven't been right yet. What pleased me the most in The Death Season is that archaeologist Neil Watson actually gets some well-deserved love. Normally the poor man just gets clunked in the head with a blunt instrument and left in one of his trenches. If you like British police procedurals with strong mysteries, a sense of history, and an excellent cast of characters, I highly recommend this series. You should be able to read The Death Season and not be confused by the characters or their lives, but don't be surprised if you find yourselves looking for the very first book in the series, The Merchant's House. These books are addictive. New to me, but sounds like something I would want to check out! It's a very good series, and this book is one of the best of 'em. I do like this series, Cathy. I think Ellis does a fine job of balancing the police procedural part of the story - the mystery - with the characters' personal lives. And that's not easy to do! No, it's not. It's a very delicate balance that's extremely easy to misjudge.